Upgrade your home with any of the beautiful vinyl flooring options we hold in stock. Adding new flooring can be the start you need to kick off a redecorating project you’ve been waiting for. Our vinyl sheet flooring comes with outstanding durability and endless style choices to suit a new vision of your home, whether you want it installed in a kitchen, bathroom, or anywhere else. Best of all, you don’t have to break the bank while making your home more beautiful, as our vinyl tile and vinyl plank flooring are among our most affordable options. Add even more life to your house with the assistance our flooring specialists as they guide you through picking out the perfect product for you. Choosing the proper flooring material for your home can be a tough decision, but it doesn’t have to be. 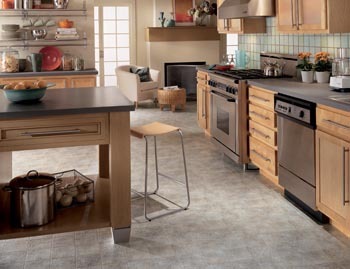 We have a variety of options available for vinyl flooring, a synthetic solution that is resistant to water and stains. Vinyl is a durable alternative to standard wood and tile flooring, and is available in a wide range of patterns and colors. Printed vinyl patterns offer the appearance of such high-end floors as hardwood, tile, or stone, with the benefit of lower costs and maintenance requirements. When outfitting your kitchen and bathrooms, you need something that can withstand the daily grind. Vinyl sheet flooring installs smoothly and stays that way even in the most traffic-heavy areas of your home. No more fretting and worrying about scratches when you pick vinyl. Pets’ claws and dropped utensils don’t stand a chance at scuffing up new vinyl sheet floors. In addition, cleaning is a cinch. It only takes light sweeping and a few passes of the mop to return your floor to looking like new. Upkeep is so easy you’ll start thinking about outfitting your entire home with it since you never have to worry about your floors warping from moisture. Simplify your life and get high-quality when you shop our vinyl sheet flooring today. If you’re looking for a flooring material that offers the feel of stone, wood, or tile without the hassle involved in cleaning, then vinyl sheet flooring was made for you. It provides the visual aesthetic of more luxurious flooring materials but features a much easier cleaning surface at a fraction of the cost. Sheet flooring is ideal for homeowners looking for durability and elegance at an affordable price, making it a perfect option for families or individuals with a busy schedule. So many people choose vinyl title flooring because of its price and the almost limitless design options. You’re in control, whether you want calm neutrals or bold browns. Advanced embossing techniques mean you get to select from more than 200 designs. If you’re looking for that great hardwood look but not the hardwood price, check out our Naturcor™ line. It comes in a wide variety of choices, including realistic looking dark and light wood. You can easily keep up with current trends because our vinyl tile floors look just like real wood with certain species, grain lines, and knots. Or, browse our stock of Hampton Resilient™ if you’re looking for realistic stone or ceramic. Discover how vinyl is perfect for any room, including a den or basement. Homeowners who are interested in wood flooring but prefer the lower cost and durability provided by vinyl floors should consider the benefits of vinyl plank flooring. It provides a look of elegance and luxury with the advantage of being waterproof and much more affordable than wood. Our manufacturers have made numerous improvements to vinyl plank flooring, especially in how it feels to walk on it. One of our most popular styles is fiberglass-backed floating vinyl. There’s good reason vinyl plank flooring is also called luxury vinyl tile, and it’s because of how it looks and feels. You and your guests won’t believe how much cushion comes out of your vinyl floors. Enjoy the excitement of enhancing your home with stylish and affordable vinyl planks that come in just the color and pattern you want. When it comes to vinyl flooring installation, the process is simple when you choose our team of professional technicians to prepare and install it for you. We have the experience and expertise necessary to provide you with quick and efficient flooring installations to ensure that your vision for your home becomes a reality in no time. We pride ourselves in not only offering the best selection of vinyl designs, but also delivering expert vinyl flooring installation. Once you pick out that perfect pattern, our installers will head out to your home right away. There won’t be any misshaped pieces or cracks once our experts finish. You’ll also feel completely confident in your purchase once you see our industry-best guarantees and warranties. If you don’t absolutely fall in love with your new floor or our vinyl flooring installation, we’ll work with you to make it right at our expense. Contact us today to be on your way to a better-looking home with our precision-cut vinyl flooring. We proudly serve Belmont, NH, and the surrounding areas.